Network security company Infoblox needed a way to search across 2 million documents on multiple databases. The organization turned to Fusion, which enabled them to design, develop and deploy a search app specifically for them. 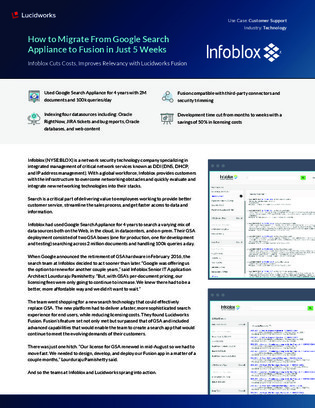 Download this case study to learn how Infoblox implemented the new search technology, and how it helps them complete 100k queries per day across 4 different data sources.